The Teaching and Learning Newsletter – a little late to posting this term. Lots of Teaching and Learning news to read about. The next INSET will be on 20 May and will be a marketplace of stalls from departments across the school – so look out for a round up of what has been happening in various departments this year. We are also presenting at the Achievement Show in London in June on our approach to developing enthusiasm for Teaching and Learning – more details to follow. 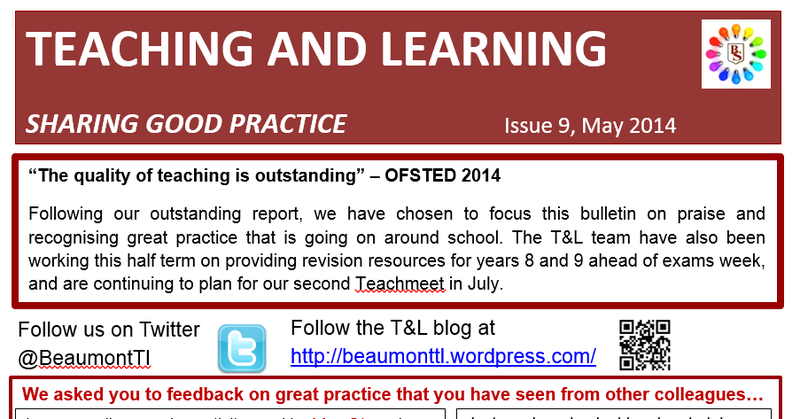 The first Teaching and Learning Newsletter is now available in hard copy with a round up of news from last term. You can find a copy of the newsletter by clicking HERE and you can find an archive of all our newsletters by looking in the resources section on the home page. The final Teaching and Learning Newsletter of the year is now out in hard copy with a round up of events and ideas at the end of the year. You can read it here or find it in the resources section on the home page. The Teaching and Learning Newsletter is out in hard copy, with a round up of news and some ideas from the term. 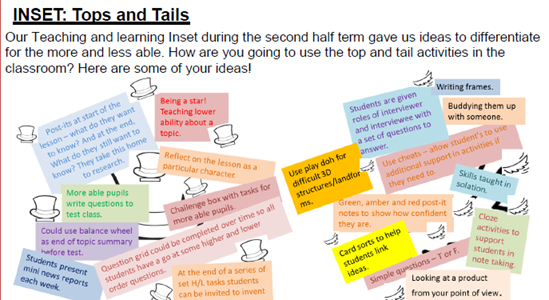 Staff were asked to give ideas of great teaching and learning ideas they had seen from their colleagues. You can read it here or find it in the resources section on the home page. The Teaching and Learning Newsletter is out in hard copy, with a round up of news and some ideas from the term. You can read it here or find it in the resources section on the home page. 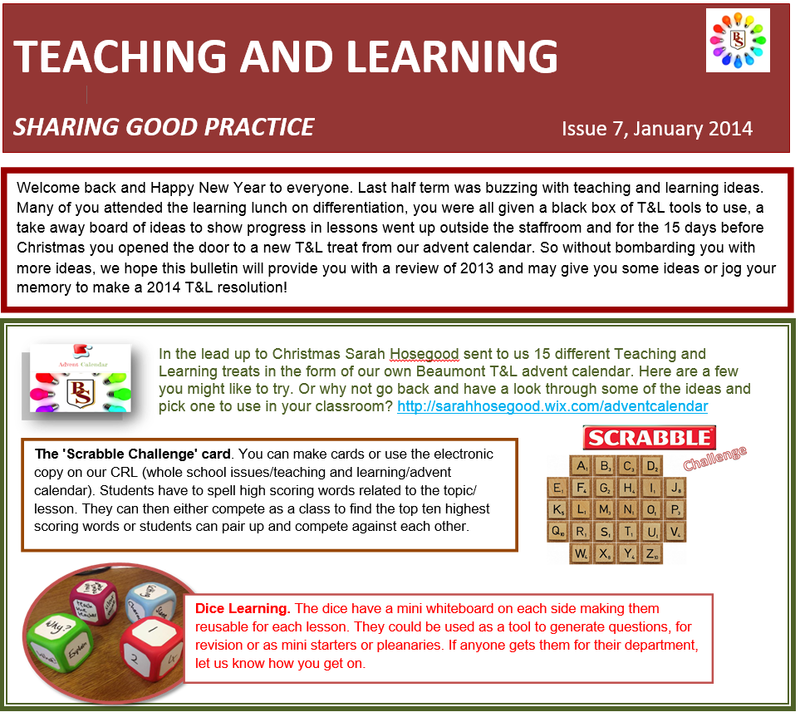 The latest Teaching and Learning Newsletter is out. Hard copies as usual have gone out to all staff. You can find a copy here or in the Resources section on the homepage. 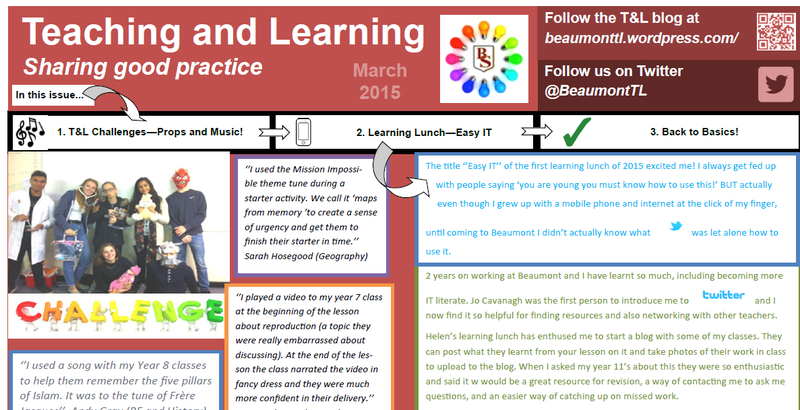 This term’s Teaching & Learning Newsletter is out. Hard copies will go out to all staff, but you can find a copy here, or by looking in Resources on the homepage.